The “Entrance to the Bear World” now has twin totem poles gracing its gateway. The two poles carved by Canim Lake First Nation (Tsq’escenemc) artist Jerome Boyce were unveiled at the Bridge Lake Ice Caves during a ceremony today that also celebrated the completion of the Jobs Creation Partnership (JCP) Project organized by the New Pathways to Gold Society (NPTGS) in the 100 Mile House area. Boyce unveiled the 10-foot poles along with Minister of State for Rural Economic Development Donna Barnett, Kamloops-Thompson-Cariboo MP Cathy McLeod and representatives from the JCP Project partners. The cedar poles feature figures of bears holding salmon. But Boyce says one has a little something extra. The twin totem poles will greet visitors at the entrance to the Ice Caves parking area off Highway 24. The area at Bridge Lake is known to local First Nations as the “Entrance to the Bear World.” This unique site is being transformed into a family-friendly heritage facility. The event also acknowledged the work of the JCP Project crew, who built three foot bridges, railings and connecting stairs and 2.5 kms of low mobility trail at the Ice Caves site. The crew also installed bear proof waste containers, picnic tables and benches and two full service outhouses. The Jobs Creation Partnership Project is a $400,000 initiative with the Ministry of Social Development and Social Innovation’s Community and Employer Partnerships Branch and other organizations, including the Highway 24 Ice Caves Project. During the 11-month project, the JCP Crew and Supervisor Thomas Salzbrenner also constructed and installed much-needed amenities at Canim Lake and along the Gold Rush Snowmobile Trail, as well as providing picnic tables and outhouses for the Recreation Sites and Trails Branch. “The New Pathways to Gold Society is proud to have participated in this project, which provided valuable skills training as well as new amenities at heritage and recreation sites along the Gold Rush/Spirit Trails Corridor,” said Society Chair Terry Raymond. The NPTGS, Canim Lake First Nation (Tsq’escenemc), Gold Rush Snowmobile Trail Regional Management Committee, Government of Canada, Ministry of Forests, Lands and Natural Resource Operations (Recreation Sites and Trails Branch) and the Province of British Columbia are also JCP Project partners. 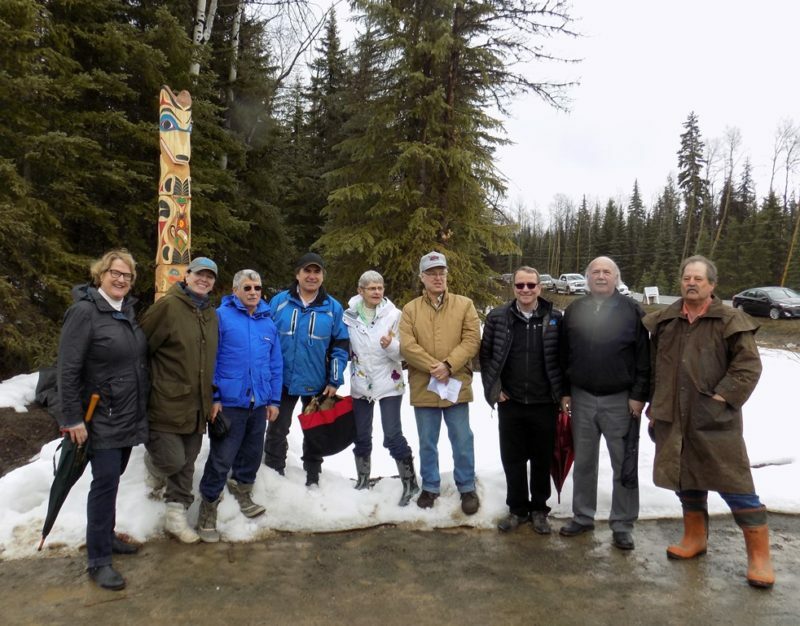 “As well as providing valuable skills training for the participants, this project created improvements that will help First Nations communities like Canim Lake attract more visitors and generate more employment,” said Cheryl Chapman, NPTGS First Nations Co-chair.